Major Research Paper (MRP): A Critical Problem with Rural Microfinance: Understanding Why Microfinance Field Workers Fail to Target the Extreme Poor in Rural Bangladesh. Zahra’s research showed that the dynamic that exists between microfinance field workers and their rural clients is dynamic and complex. Grameen-style microfinance has been developed with certain assumptions about this client-lender relationship, which are not necessarily accurate when dealing with microfinance in practical terms (e.g. about the formation of microfinance groups, group solidarity, and the neutrality of field workers, that exist within the Grameen-system). Looking at institutional pressure and lack of training for field workers provided insight as to why field workers do not generally target the extreme poor. There are many issues relating to how microfinance institutions treat their staff that need to be resolved before microfinance field staff will be able to effectively assist the extreme poor. She also included a discussion of the benefits and drawbacks of commercializing microfinance institutions. She concluded that commercialization would not be in the best interests of the extreme poor. While microfinance institutions may become more stable and efficient, there would be even greater pressure placed on field workers to maintain high repayment rates, and this would further discourage field workers from targeting the neediest of the poor. 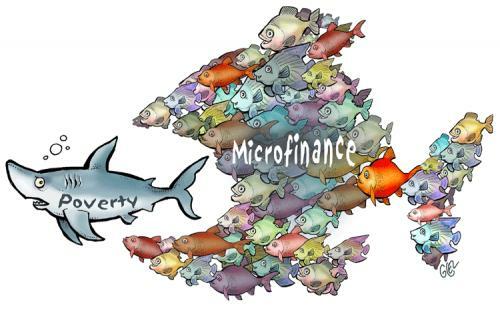 Microfinance institutions be divided into two organizations: one targeting poor groups near the poverty line, and the other targeting the ‘extreme poor’. To better reach marginal groups, staff performance should be evaluated based on the diversity of a field worker’s portfolio of clients, the creativity a field worker exhibits in engaging clients, and the longevity of relationships that the field worker is able to maintain. Microfinance institutions place greater emphasis on staff training, especially rural sensitivity training (even for field workers from a rural or semi-urban background ). For more information contact me or Zahra herself (through LinkedIn).